Anachronista: Ye Old Times - movie pre-review! Ye Old Times - movie pre-review! Forsooth and Huzzah! Some of you may know of my 'fanboy' attitude towards Jack Black. I really do think he's John Belushi's comedic heir. He satisfies my thirst for silly, yet vulgar comedy. I'm pretty sure he's part muppet, too. Which makes him a literal 'jester' in my book. 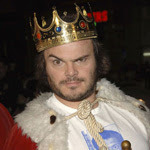 He has come one step closer to my dream ( Jack Black joins the SCA ) with the upcoming movie, "Ye Old Times". I don't know when this movie about "two rival fairs vying for ownership of all things Middle Ages" will be shown in theaters, but I'm hoping that he'll do some character marketing. Both Cinematical and the British Empire magazine have pondered the humorous possibilities of this new movie. But it's not JUST Jack Black. Looking at the rest of the cast finds even more treasure! Tim Robbins, Will Arnett, Cary Elwes and a cameo by John C. Reilly....oh, man. I can't help but speculate. Cary Elwes. That's Wesley from The Princess Bride. I can sooo see him in the role of the old creepy elf dude in the velvet cape who still thinks he's the hottie of the RenFair. And Tim Robbins either should be King of the Faire or a sensitive viking. Yes. God. Please. The pool of inside jokes and one liners from those two actors alone could carry the whole movie. This is pure speculation. I have no idea what roles anyone has, save Jack himself as Professor Shockworthy -- the movie's narrator who tutors some "romantically entwined characters in the mysterious ways of love."